The grand and majestic mountaintop retreat of Baloth Bloodtusk was sealed off in the First Era by King Joile, but its ancient Orcish halls were recently reopened by order of King Kurog. 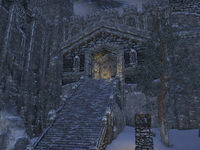 Pariah's Pinnacle is a notable player house in Wrothgar near the Maelstrom Arena. This page was last modified on 19 November 2018, at 07:24.